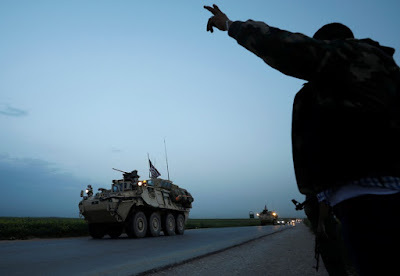 BEIRUT/ISTANBUL (Reuters) - The U.S.-led coalition is working with its Syrian militia allies to set up a new border force of 30,000 personnel, the coalition said on Sunday, a move that has added to Turkish anger over U.S. support for Kurdish-dominated forces in Syria. A senior Turkish official told Reuters the U.S. training of the new “Border Security Force” is the reason that the U.S. charge d‘affaires was summoned in Ankara on Wednesday. The official did not elaborate. The force, whose inaugural class is currently being trained, will be deployed at the borders of the area controlled by the Syrian Democratic Forces (SDF) - an alliance of militias in northern and eastern Syria dominated by the Kurdish YPG. WNU Editor: Such a militia .... backed by U.S. weapons, training, and (probably) fire-power .... will be a formidable force. I guess this also explains Turkish President Erdogan's threats this morning .... Turkish President Erdogan Vows To Destroy The Kurdish Enclave In Northwest Syria. I am also sure that Syrian President Assad is not amused having this force present in the country. China Wants To Deploy Lasers In Space To Destroy Space Junk. Could This Also Be Used As A Weapon?